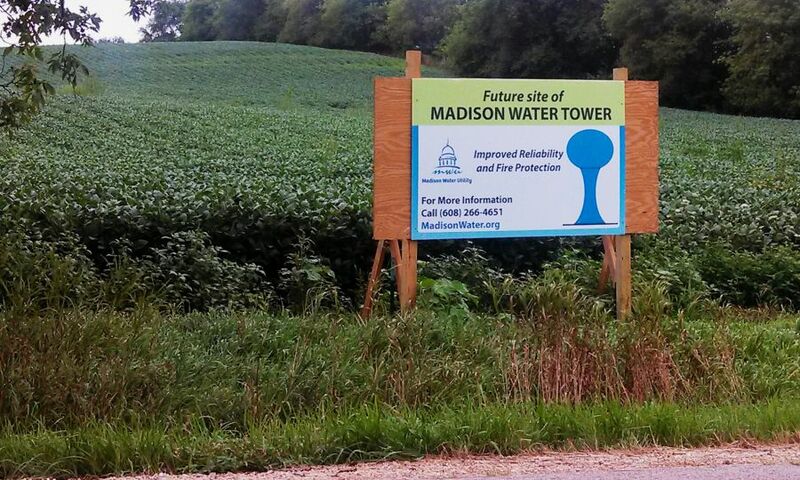 It’s pretty hard to miss – a large sign posted at the edge of a cornfield on Old Sauk and Pioneer roads that reads, “Future site of Madison Water Tower.” But the sign isn’t actually in Madison. It’s in the Town of Middleton. Predicting growth on the far west side, Madison Water Utility bought 17 acres of land in the Town of Middleton back in 2000. Today, that land is about a half mile from the westernmost edge of the City of Madison, and the utility insists now it the time to use it for a tower. One of the first steps will be to annex the land into the City of Madison. The utility will also begin working with neighbors living on the far west side and in the Town of Middleton on design of the facility, currently being called the Blackhawk Tower. Once completed in 2018, it will hold a million gallons of water – easily the biggest water tower on the west side. Larson insists those near-future needs are pressing. Holmgren admits that news of the Blackhawk Tower probably comes as a shock to many neighbors in the Town of Middleton who get their water from private wells and won’t see any direct benefit from the tower. Some nearby residents interested in giving input have already visited the project website to join the Blackhawk Water Tower email list, where they’ll get surveys, regular updates, access to design drawings and notifications about public meetings. Larson says the $3.6 million tower is a major infrastructure project for the utility, one that likely means much more than water is coming to the area.